Kit supplier Hummel switched from the previous seasons black away kit to a striking all white kit. The away shirt was an identical design to that of the home. It had vertical shadow stripes on the white material, contrasting with the black ‘Anglian Home Improvements’ shirt sponsor. 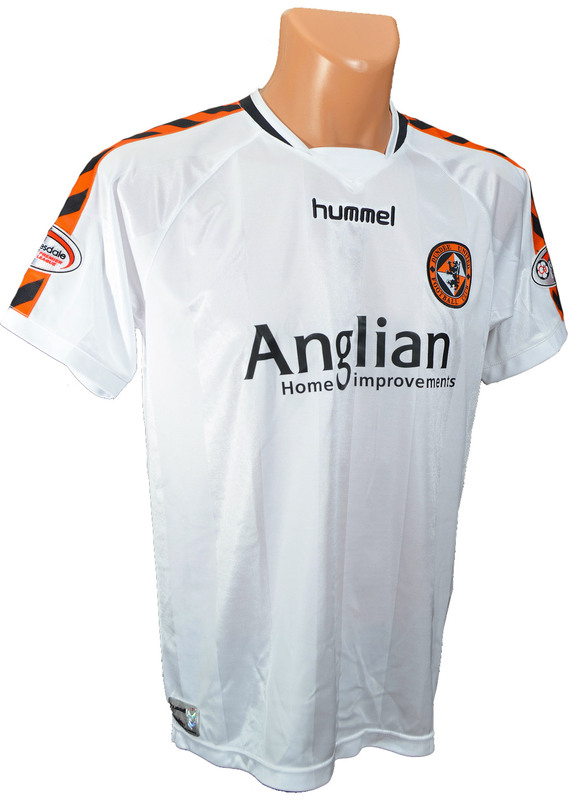 The black and tangerine chevrons lined the sleeves as on the home shirt. The Hummel logo was black and situated centrally below the black collar. The strip was a first for the club in that it was based on the output of a fans’ survey. Steven Robb was the star who was on hand to model the new strip at the official kit launch. 2007 was the first year that sponsorship was allowed on the back of shirts and it was the logo of Fat Sam’s nightclub that was positioned just above the player’s name. United continued with the Spanish based real estate company, Ole International, as the sponsor on their shorts. The numbers on the back of the shirt were black with a white trim. All Scottish Premier League sides that season wore a Clydesdale Bank S.P.L. emblem just below the shoulder on both sleeves. United wore the shirt in six away matches against Aberdeen, Hearts and Motherwell in the 2007/08 season. Their best result in the away kit was a 3-1 victory at Tynecastle when Jordan Robertson netted a brace and Barry Robson scored a late penalty in front of over 16,000 fans. The last outing of the kit was during a 2-1 defeat at Pittodrie.